Quinoa Salad with Salmon – so delicious, nutritious and easy to make. Takes only 20 minutes to make. Perfect for dinner or lunch. Today, I am going to share with you a very simple quinoa salad with salmon. The dressing in this salad makes all the difference though – quick and easy to make and yet it has a sophisticated taste. The flavor is truly amazing – white wine vinegar, water, coconut sugar, garlic and jalapeno slices are mixed together and cooked for a couple of minutes on the cooktop. It adds a really nice sweet tangy taste to the salad and pairs well with the salmon. You can cook the quinoa ahead of time and store it in the fridge. That way it won’t take you but 15 – 20 minutes to prepare this meal the next day. This recipe makes enough for 4 people. How has your week been? Mine was nice and warm despite the heavy rains and storms. I have been watching the news, and my heart hurts seeing all the tragedies and destruction caused by the tornadoes. I hope you and your loved ones are safe! My prayers and thoughts go out to those affected by the tornadoes, especially those in Texas, Oklahoma, Kansas who experienced numerous tornadoes this month. Back to the recipe for Quinoa Salad with Salmon. Wash quinoa thoroughly and cook according to package instructions. Wash vegetables and chop/dice them. Sprinkle salmon evenly with 1/4 tsp salt, 1/8 tsp freshly ground black pepper and 1/4 tsp garlic powder. Place salmon on a foil lined baking sheet and broil for about 10 minutes. For the dressing, I used the dressing recipe from the Grilled Chicken with Zucchini, Radish and Cherry Tomato Relish. Combine vinegar, water, sugar (or honey), garlic, jalapeno slices, and 3/4 tsp salt and 1/4 tsp freshly ground black pepper in a small saucepan, and bring to a boil. Remove from heat. When salmon is done, flake fillet with a fork into small chunks. Combine cooked quinoa, halved cherry tomatoes, diced cucumber and onion, chopped basil leaves and salmon, in a large mixing bowl. Season with the remaining salt and freshly ground black pepper. Drizzle with olive oil and with the salad dressing on top, and toss gently to combine. Quinoa Salad with Salmon - so delicious, nutritious and easy to make. Takes only 20 minutes to make. Perfect for dinner or lunch. Combine vinegar, water, sugar (or honey), garlic, jalapeno slices, and 3/4 tsp salt in a small saucepan, and bring to a boil. Remove from heat. Combine salmon, cooked quinoa, halved cherry tomatoes, diced cucumber and onion, and chopped basil leaves in a large bowl. Season with the remaining salt and freshly ground black pepper. Drizzle with olive oil and with the salad dressing on top, and toss gently to combine. Serve warm. Enjoy! This looks so amazing and healthy! I’ve been thinking of a dish to make this weekend to help detox from Memorial Day. I’ll have to try this! This dish screams spring and I love it! So bright and fresh and pretty, by the way!! Delicious! This is such a gorgeous and healthy dish! We adore salmon dishes. I love all the bright and fresh flavors in here! Salmon is my favorite sea food too, I eat fish at least couple times a week. Thanks for stopping by, Kelly! This recipe is so refreshing and I have to say delicious – salmon & quinoa are perfect together. Reading you recipes I see that they are easy, healthy & refreshing, perfect for summer nights. Yummy! I will let hubby know about this as he’s a huge salmon and quinoa fan so this is so perfect for him! Pinned. Still working on getting my kids to like quinoa. It’s a bit of tough sell at times but we’re getting there! I love how healthy this is! I love salmon pretty much any which way it’s served, but I am on a quinoa kick lately now, too, so of COURSE I should be combining the two! Thanks for the inspiration! Two of our favorite things – salmon and quinoa! This looks great. Love that it’s served warm. We eat salmon a few times a month and I love your idea of incorporating it into a salad. 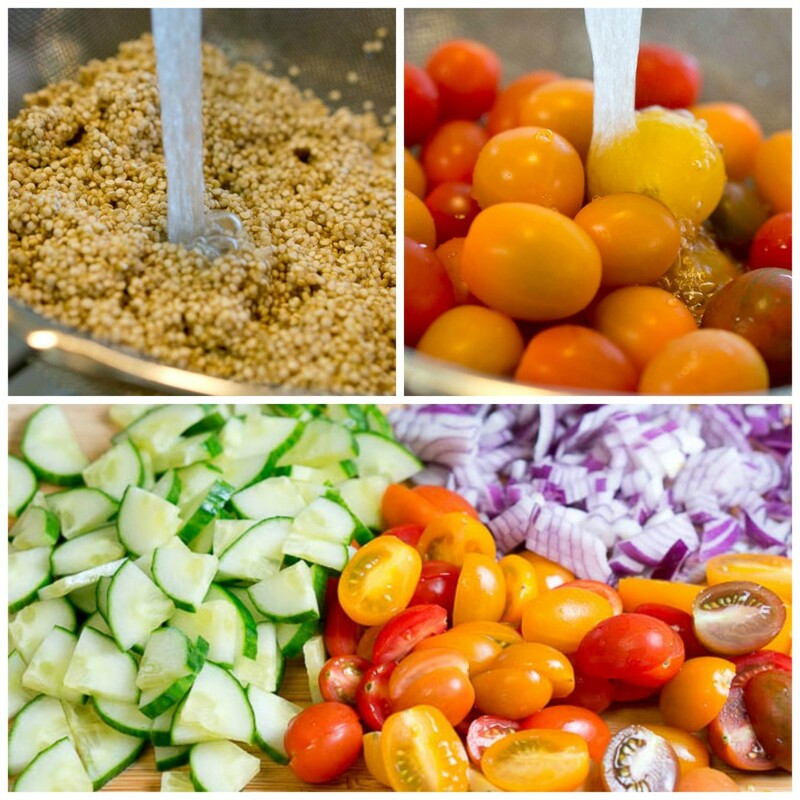 Quinoa gets overlooked sometimes at my house, this is a great way to bring it into our meals. I know my family would love this. I liked this salad so much that it was really hard not to eat more than my share. Used cilantro in place of the basil and honey in place of the coconut sugar. Grilled the salmon. Wish there were leftovers for lunch. So glad to hear you loved this salad, Terry! 🙂 Thanks for stopping by! Absolutely delicious! Great way to use leftover salmon from dinner for lunch the next day. I added some feta cheese and I think I’ll top with avocado next time too.